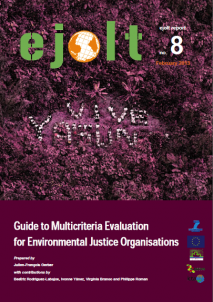 This introduction to multicriteria evaluation methods for Environmental Justice Organizations (EJOs) intends to help activists to clarify whether multicriteria assessments can be useful in their struggles – that is, as carried out by themselves or as something that has to be done by an appropriate body. In the present guide, we review three MCEs that are arguably today the most relevant for EJOs. These particular MCE methods have been chosen because they are widely recognized, participative, and doable with relatively limited means. They are: Social Multicriteria Evaluation (SMCE), Multicriteria Mapping (MCM), and the Integraal framework. While only one aims at calculating a ranking of the different options – the SMCE –, the other two provide a way of comparing and analysing the different positions involved in a multicriteria problem and may (or may not) end up with a clear final ranking. The three methods build on a number of common principles: they all (1) have a strong element of public and/or stakeholder engagement; (2) account for different types of knowledge (monetary and nonmonetary; quantitative and qualitative data); and (3) provide opportunities for learning during the appraisal process. After a description of these three different MCE methods, the guide takes the ‘leaving oil in the soil’ campaigns, with special emphasis on Ecuador and Nigeria, as possible examples for future MCEs. Authors: Julien-François Gerber with contributions by Beatriz Rodríguez-Labajos, Ivonne Yánez, Virgínia Branc, Philippe Roman, Liz Rosales and Pierre Johnson.